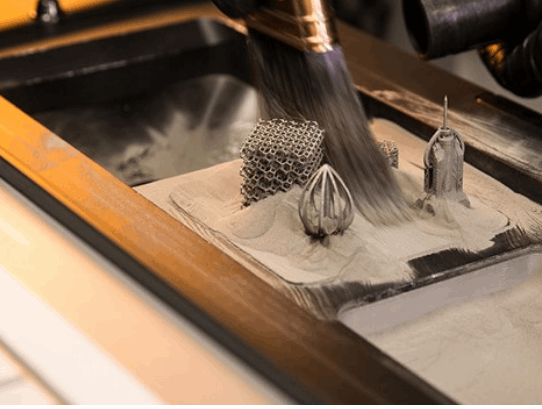 Proto Labs’ Direct metal laser sintering (DMLS) process is an industrial 3D printing process that is ideally used for prototyping in production-grade materials, functional, end-use parts, and for reducing metal components in an assembly. These fully functional metal prototypes and production parts can be created in 7 days or less. The DMLS process works by sintering each layer with a laser aimed onto a bed of metallic powder. The building platform is shifted down after each cross section layer of powder is micro-welded and a recoater blade moves across the platform to deposit the next layer. The process is repeated until the build is complete. After the process is finished, powder is removed and followed by the appropriated heat-treat cycle to relieve any stresses. Parts are then removed from the platform and support structures and then finished with any needed beading blasting and deburring. Final DMLS parts are at near 100% density. For more information on Proto Labs’ DMLS capabilities and guidelines, visit the Proto Labs webpage.